Alarm Clock Maker is help you to create your favorite image to your clock and you can share your own alarm clock with your frields easily. 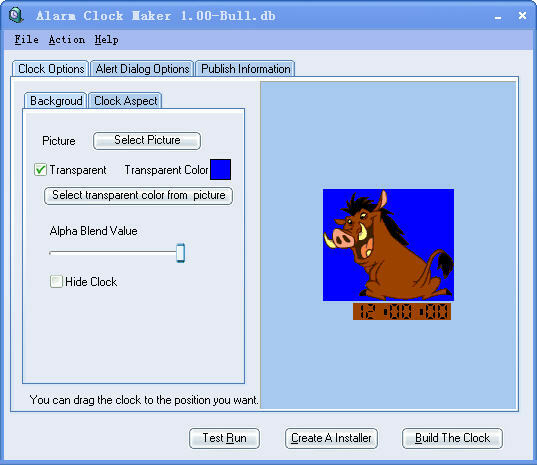 Alarm Clock Maker Features: No Plug-in required by the end user; Set the background picture transparent; Allow user test run their alarm clock; Can create a single setup packet, and share your clock with your frield. When you distribute your own clock, you can add your own information in your alarm clock. * Can create a single setup packet, and share your clock with your frield. * When you distribute your own clock, you can add your own information in you alarm clock. Qweas is providing links to Alarm Clock Maker 2.02 as a courtesy, and makes no representations regarding Alarm Clock Maker or any other applications or any information related thereto. Any questions, complaints or claims regarding this application Alarm Clock Maker 2.02 must be directed to the appropriate software vendor. You may click the publisher link of Alarm Clock Maker on the top of this page to get more details about the vendor.